Deep beneath the Amazon, lay a kingdom of the 30,000 mermen. One fateful day, this peaceful aquatic empire was shattered and destroyed by a tremendous earthquake and volcanic activity. The merman emperor and hero Rikuo (known as Aulbath in Japan), was alone. His empire destroyed, he was filled with rage and when he found out that Pyron was the one who caused the fall of his empire, he vowed to destroy him. But when he met another survivor, Aqueria, he settled down with her to rebuild his empire. He and his wife moved out of the Amazon into the great ocean to raise their family. Currently, family consists of his wife Aqueria, his three sons and 12 soon to hatch eggs. Rikuo and his family live in a crack, 150m deep. The current of the ocean doesn't make its way into the area and is a perfect location to protect their eggs from danger. His current self-imposed duty is to search for any other survivors of his kingdom. He searches in a radius of 200km for any other surviving mermen. Though close to his home is a deep oceanic trench, with a fast ocean current running through it. If Rikuo fell into the trench, even he couldn't swim against the strong current. And the deepest he could search was 1000m deep. It was an endless search, but Rikuo believed that other mermen had survived. When hit by Anakaris' Pharaoh's Curse, he becomes a simple frog. When attacked by Demitri's Midnight Bliss, he becomes a traditional mermaid, with a human top and a fish bottom. Rikuo's name is a play on Ricou Browning, the actor who played the titular character of Creature from the Black Lagoon in underwater scenes. 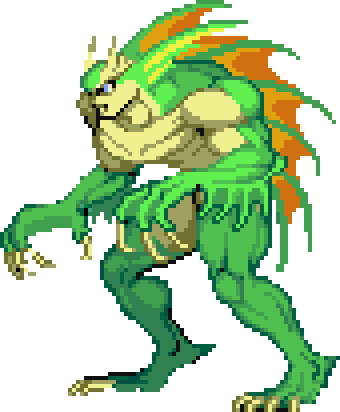 In his Vampire Savior ending, Jedah is surprised that Rikuo's intelligence has allowed him to discover the dark messiah's true purpose. This makes Rikuo one of the few characters not to be deceived by Jedah's illusions in the Majigen. 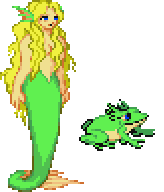 Aqueria was an ordinary female of the merman race. At the time of the destruction of her kingdom, she had been swimming on the outskirts of the kingdom. She was swallowed by the current caused by the eruption. When she awoke, she was thrown into an unknown world, onto land. She had been thrown into the dense forest of the Amazon. Not knowing how to get home, she searched for any place with water. After searching for half a day, she found a lake which she considered little more than a puddle of water (this was a lake Rikuo visited often). She waited for a few days but there was no signs of her friends coming to save her. After making up her mind, she follows a faint smell to an entrance to an underground river. She then makes her way back to her kingdom. When she came back, she saw her kingdom swallowed by a dark crack in the sea. She intuitively realizes that she had lost all her friends and crumbles to the ground without any words. But she still had not lost hope. She believed that king Aulbath would have somehow survived the disaster and would still be alive somewhere. And that he will come save her soon. After believing and waiting for half a year, the young girl and Rikuo Aulbath are reunited. A new love is born and the beginning of a new kingdom had started. Rikuo Aulbath's kingdom is different from a Monarchic government/Imperical Rule. There are no royal families. Each king is chosen by the previous king after obtaining the people's consent, and the next king is chosen. Every merman is given a rank and they are strongly united and they keep a mutual trust with this. The ranks do not mean a social position but it is more used to give each one a job that suits them. Those who gather food, those who protect their own from danger, those who create habitats, those who care's for the young etc. Out of these many jobs, raising the young is usually done by the males (The females are raised by their own mothers). In the case of males, their mimicking abilities (all Mermen have the ability to shift parts of their body at will, as seen when Rikuo fights) is usually used to scale their strength level. It is important for those caring for the young to pass on this ability. This mimicking ability is not just changing the appearance, but to also use the ability of which they are mimicking. One who excels in this wins everyone's respect. Rikuo Aulbath had mastered this ability beyond anyone else. It can be said that for his son Ricky (Alba in Japan), he is the greatest teacher. The Merman race have reproductive periods. The average time for Mermen to lay eggs is around the human age of 16 to 22. They bear eggs two times within one year averaging about 10 to 20 eggs. On average, a couple lays 60 to 120 eggs. But only 10% of these hatch and out of those, only 2 to 5% of these survive. A few hundred years ago, the lake they used to live in was fresh water. But within decades, sea water had flowed in and caused the salt level to rise. This may have been the reason why Rikuo and his family could live in the sea without much trouble against the salt level. But this may also be the reason for the decreasing birth rate. This page was last edited on 20 February 2018, at 02:53. This page has been accessed 23,205 times.